A Day In The Life Of...: Flash! 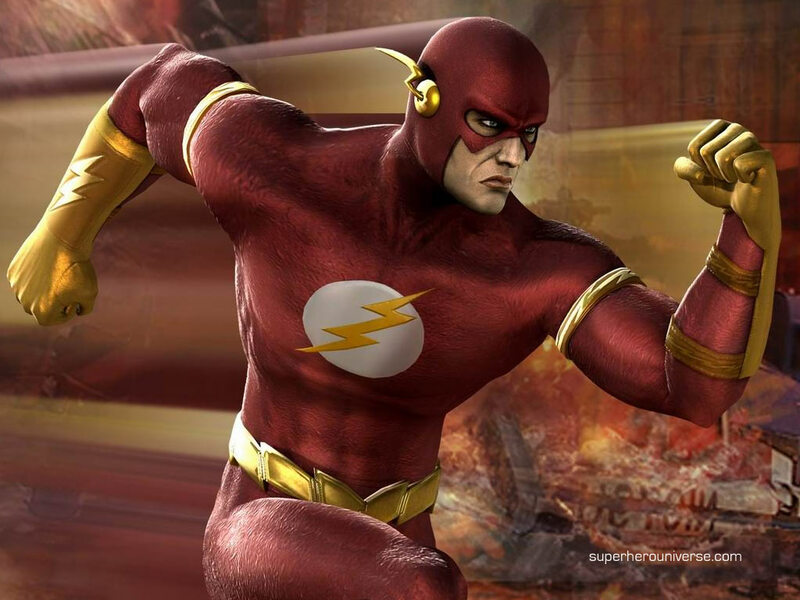 ﻿Known as the "Scarlet Speedster" or "The Fastest Man Alive", the mantle of The Flash has been donned by five different heroes over the years; Jay Garrick, Barry Allen, Wally West, Jesse Chambers and Bart Allen have all served as the Flash. Bart first appeared in full in Flash volume 2 issue 92 in July of 1994, having previously appeared briefly at the end of issue 91. He was created by writer Mark Waid and artist Mike Wieringo. Bart's life flashes by, Born to Don Allen and Meloni Thawne, the fourth Flash, Bart Allen, actually hails from the future, unlike the other Flashes before him. In his time, the 31st Century, Bart's father and Aunt Dawn were killed by the Dominators when they took over the planet. They then captured Bart but luckily he was saved before any harm could come to him. Being born with super-speed, Bart suffered from a hyper-metabolism and aged at an exponentially increasing rate. Traveling with his grandmother, Iris West, Bart went to the past and met Wally West, the third Flash, who was able to help stabilize Bart's metabolism and stop his aging at roughly 14 years old. Bart was actually mentored greatly by Max Mercury and Wally West. Bart served as Impulse instead of Kid Flash for a time due to his immaturity. While Impulse, Bart founded Young Justice alongside Robin and Superboy, with Wonder Girl soon joining afterwards. The group disbanded after the deaths of Omen and Donna Troy, which they found themselves to be partially at fault for. Bart and the others were recruited by Cyborg to become a part of the new Teen Titans. On the team's first mission Impulse is attacked by Deathstroke and undergoes surgery for a destroyed kneecap. Recovering quickly due to his rapid healing, Bart emerges a 'year' (to Bart, not even actually a day) of self-exile in the public library as Kid Flash. Bart grew very close to his teammates and was there when things started to go nuts during Infinite Crisis. After Superboy-Prime attacked Conner Kent (Superboy) in Smallville and injured or killed many Teen Titans, Bart joined with Flashes Wally West and Jay Garrick to stop the rampage of Superboy-Prime, by running him at top speed into the Speed Force. Jay reached his limit before entering the Speed Force and Wally turned into energy and vanished, leaving Bart alone with Superboy-Prime. Barry Allen, Johnny Quick and Max Mercury, all of whom had previously been absorbed into the Speed Force, appeared and aided Bart. After taking Superboy-Prime into the Speed Force, Barry told Bart that "Wally is waiting for you". 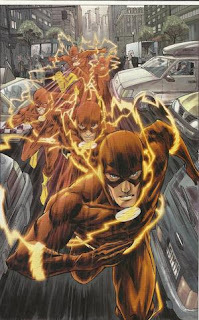 After they disappeared, Jay claimed that the Speed Force was gone. Bart spent four years in an alternate reality's Keystone City, with Max, Barry, Wally, and an alternate version of Jay Garrick. There Superboy-Prime managed to escape from his prison, and the alternate Jay failed to stop him. All the speedsters rallied together to return to their dimension so they could warn everyone about Superboy-Prime. However, they knew that not even the fastest men alive could get there before the insane Boy of Steel. Barry suggested to Wally that he somehow absorb the entire Speed Force, but cautioned that it might kill him. Bart bravely volunteered, because Wally had his family to think of, and Barry was incapable of it because he was already dead. Wally handed him the ring and Barry gave Bart his Flash suit, which would both help Bart survive his journey. Evolution to becoming the Flash, Bart reappeared in Tokyo wearing his grandfather's costume. He later helped the heroes against the army of escaped super-villains in the Battle of Metropolis. Bart then explained to the nearby Wonder Girl that his grandfather's uniform was the only thing that could survive the trip back from where he had been, and that he was the only one there "who could still run". Bart then unleashed his anger against Superboy-Prime for killing Conner Kent, pummeling him at super-speed and forcing Superboy to retreat from the battle. Bart would become the Flash when Jesse Chambers lost her powers, but not for long. He would die at the hands of his Rogues, in a plan orchestrated by Bart's evil twin Inertia. During the Legion of Three-World's event, Bart Allen was resurrected by the Legion of Superheroes. During Superboy Prime's assault, Bart returned as Kid Flash, alongside his old pal Superboy, just in time to help save the day. Bart then returned to the present in his teenage form and decided to remain Kid Flash. When Barry Allen returned, Bart was initially angry that Max Mercury did not escape the Speed Force as well, as he felt no real connection to Barry but in many ways considered Max to be like a father to him. This didn't stop Bart from helping out Barry in his time of need though, as Professor Zoom returned to haunt the Flash family once more. Through the course of events that would form a Flash family rebirth, Max indeed did return, much to Bart's delight. The united forces of the various speedsters then pooled together to stop Zoom once more. Not long after, Bart rejoined the Teen Titans in their time of need, aiding the team in Dakota and in the process becoming a full time member again.